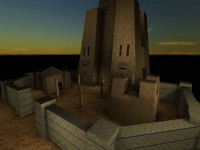 An Egyptian/Babalonian themed map, it uses huge geometric forms, but the gameplay doesn't match the size. A notorious 'First Map' this is somewhat better than most first offerings. I actually recall this from way back in 2001 or 2002 and was fiarly impressed with it then. So back then I may have scored it higher. Now that Level design standards have changed a bit, the map is going to score lower than it would have 'back in the day'. The textures used are somewhat standard egyptian stone walls with a pinch of techiness thrown in. It works to a certain extent but as the tech theme is scattered about it ends up coming off as somewhat jarring. The textures are mostly un-aligned however due to the shapes the author chose, this is somewhat excusable. One the other hand there are some 90 angles as well as vertical alignments that are off. You probably won't notice much of these during casual play but they're everywhere. The lighting tries to be good but ends up coming off as somewhat ambient in most places - most notably the outside areas. Still, considering this is the mapper's first work, it's not a bad effort. There is a bit of shadow work scattered around the map and nothing's overly bright nor overly saturated. The architecture, as expected, is egyptian in style but I think also hearkens a bit to the Babalonians. Obelisks dot the exterior bases, the buildings all take their shape from the obelisks, but are fairly bare aside from the texture and some symbols. Considering their sizes, this does create quite the dramatic effect. However, below the buildings is a whole second section of the map that looks and feels much more modern. Almost like ancient egyptians lived above and egyptians from the future lived below. 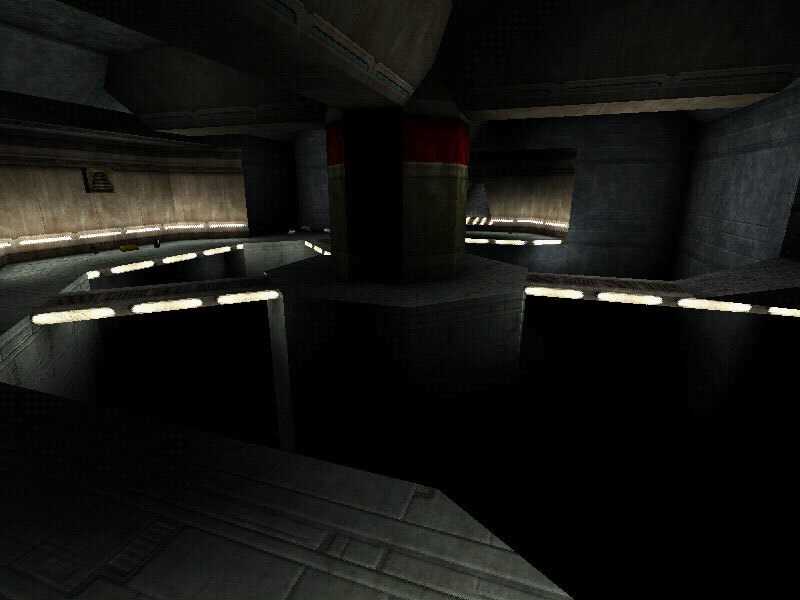 The tech areas are not quite as nice architecturally, but they do keep to the same minimal feel of the top areas. It's an interesting contrast that has potential but I don't really feel like it lived up to it in this map. Overall, the textures go together fairly well although there are many misalignments and nothing is trimmed. The lighting is satisfactory but definately needs furthur development, and the archtecture is good for the old areas, but the tech areas need more attention. For a first time mapper, the author did a fairly good job with the build. The map is appropriately, if a little oddly, zoned, the BSP is well made and the teleporters and lifts do their job well. Obviously the author put in much time learning some of the editor's intricasies. Unfortunately the author failed to put the same amount of effort into the sound. There are 14 ambient sounds in the map which is woefully inadequate for a map this size. They're mostly wind sounds and the author really should have rounded out the map more with sound. The gameplay here is a bit of a mixed bag. There are some good areas with decent z-axis and some interesting opportunities. The flag bases are nicely designed if a little heavy on the z-axis. 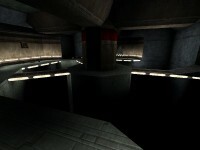 And some ofthe lower tech areas have some nice aspects to them. However, the long straight tube at the bottom, and the flag run from base to base are all too straight and open. The tube especially is a hinderence because if it's you and another opponent, the one with the higher health/armour and greater firepower is the winner. There's no room to employ any kind of strategy. The upper path across does provide the capper with some cover when in the middle building, but other than that, they are pretty much out in the open on a straight path when between bases. One can use a teleporter in side buildings in the base courtyards to access the middle tower more quickly and this is probably the best gameplay aspect of the map. There are numerous alternatives to the central open route but it's the one you'll try to conquer most often. The weapon layout seems a little off but is satisfactory. The shield belt, keg of health, and 100A are all accessible very close to each other at the top of the central building and this is just bad placement. Snipers will love this map for the tall buildings and the view of the open upper area. Flag cappers beware of the upper route. In general, the gameplay has many rough spots but there are some nice areas to take advantage of. 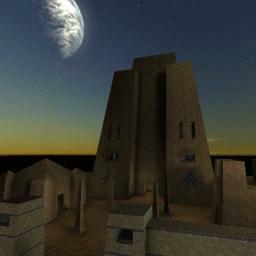 Put in perspective, this huge CTF map has many things to reccomend to it and many things to stay away from. For an interesting, somewhat novel CTF, it's worth a download to try out. But if you have better things to do and aren't so much of a CTF fan, then go do those other things. Yet, if you're thirsting for some old-style UT99 action that's not retail, then give it a go. I love this map, lots of fun to play. I highly recommend it to all! Difficult the flag is to cap'. Let this flow through your internet tap. 7.5 really. A couple bad textures were used, bases are rather large, outside is a little blah. But I do like the setting, and some of the architecture ain't bad. It just seems like it's lacking something. It's worth a download to see for yourself. One of my favorite maps. There actually are a lot of little things that i don't like much about it but i always have fun playing on it. The outside areas, the towers and that middle wall are great for sniping and the underground parts are good for more up close fighting. My best moment is jumping off the tower with the flag, translocating down, catching the flag when it falls and running. I got away with that so many times. Like i said some little things bugged me. Mostly just little visual stuff i thought could have been done better but once i'm playing the map i just have fun and don't even notice that stuff. Anyways those are my thoughts on it. Simply one of the best!. Super job. first seing the map, it looked a bit bland, when i played it..visuals was the last thing i was thinking about, some of the best gameplay ever!..mixture between open spaces and close combat for a variety of players, lots of ways into each base, tons of z axis..and i mean, this game has z axis written all over it..
this map doesnt need eye candy, the gameplay makes the visuals obsolete! This is one I'd love to see brought into UT2K3/2K4. The egyptian theme goes perfectly with those games. 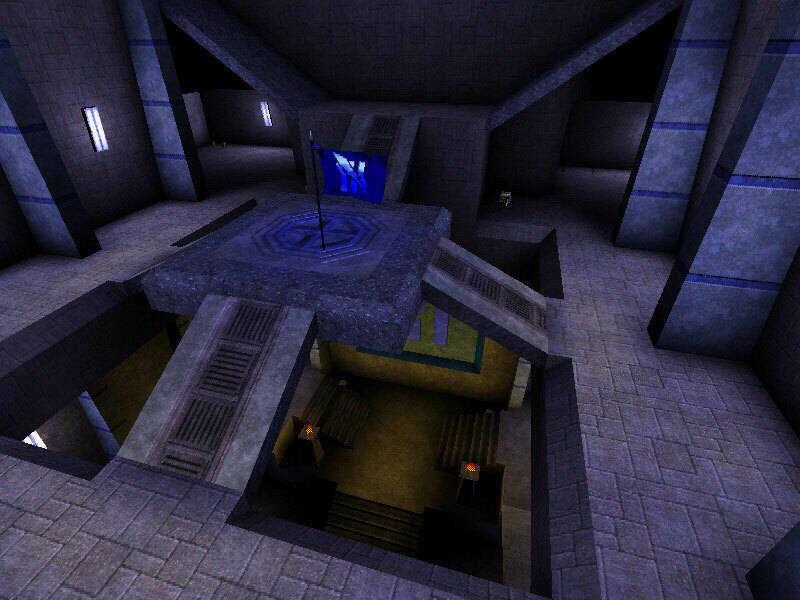 Just been reminded how great this map is, still the undisputed heavy-weight champ of the UT CTF scene. I can't decide between 8.5 or 9 for this one...if there was an option to choose 8.75, I would have taken that. 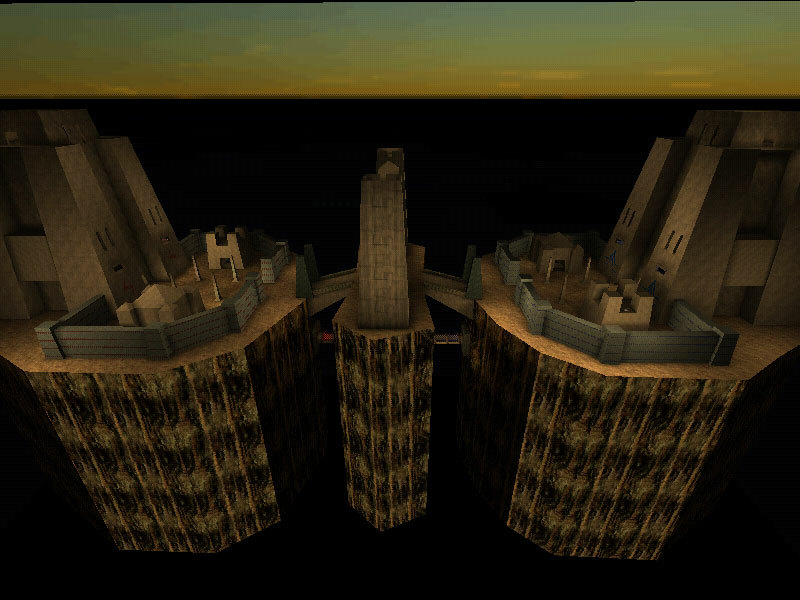 Fantastic map though...architecture is great, and although the skybox is simple, it's one of the most beautiful I've seen...the setting sun on the buildings is very well simulated in this map as well. Why not a 10? A few reasons...although I generally play a heavily modified game myself (Low Grav + Bullet Time + U4E) this map really needs both low grav, due to the height of some of the architecture, and some of the long-range weapons present in U4E. So people who prefer a more vanilla game might not like it as much. Another thing is that the uniformity of texturing might bore some people. It works well enough for what the map needs, but it is fairly bland. The final .3 of a point that I've taken off is both for minor nitpicks with the botpathing, and also the fact that the author put the map together in a way that causes the architecture to disappear if you try to edit it, which means I can't fix the botpathing up. 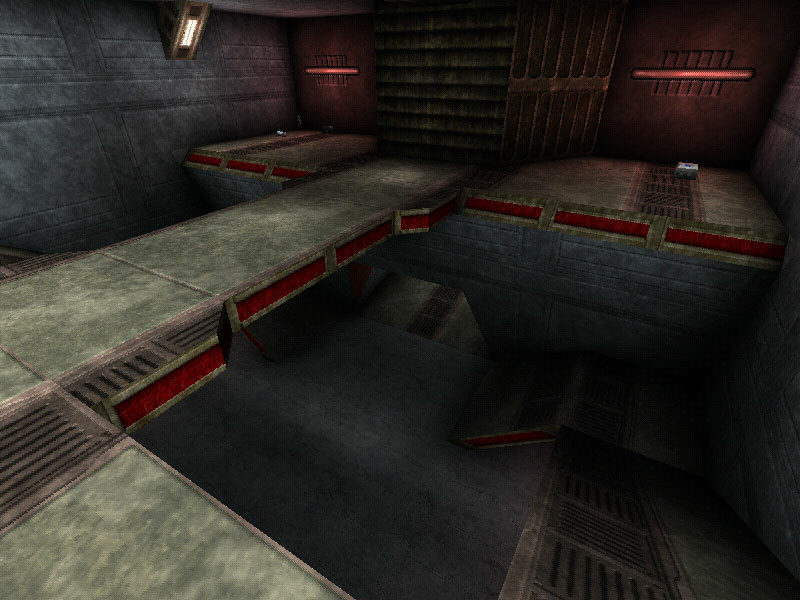 The bots play well enough...I'd just add one or two more paths...It would also be good to see this map with builtin support for the Strangelove mutator, as well perhaps. All in all though, it's very difficult to complain about this one...I've had it on my hard drive for years, and I think Manticore's endorsement says it all. Given that I've noticed him being a very tough critic in the past, when one comes along that he does like, I take that as an indication that it really is outstanding. I agree with him in this case, too...if you haven't checked this one out yet, do yourself a favour and download it. I don't know why I have never commented on this map before.....It's one of my favorite maps out there! It is Great! Truly a very well done map! Must've taken a Really long time, I'll check it out on the readme. I forgot to redownload this after a hard drive crash!